Scientists, economists and sci-fi buffs alike have long predicted the arrival of robots – a day when smart machines would come to take our jobs and replace human touch and individuality with impersonal, cold technology. In hospital operating rooms throughout Georgia, the robots have arrived. But rather than taking jobs, they are creating the need for specially trained and highly skilled surgeons, says Dr. Shady M. Eldaif, a thoracic surgeon in Atlanta who uses robots in about 90 percent of his surgeries. “The robot is an extension of the surgeon,” he says. Rather than bringing a cold, assembly line-type approach to medicine, robots are enabling surgeons to perform highly individualized and intricate surgical treatments. And they’re doing so with less pain and blood loss and shorter recovery times than was previously possible. Although the first robotic surgery system for general surgery – the da Vinci Surgery System – was approved by the FDA in 2000, robotic surgery still tends to have an air of mystery about it, says Dr. Karen Stuart, a gynecologic surgeon at Columbus Regional Health who uses the da Vinci robot for many of her more complicated surgeries. “When I tell people they will have robotic surgery, I let them know R2D2 will not be in the operating room, but I will,” she says. Columbus Regional, which got its da Vinci robot in 2012, is a relative newcomer to robotic surgery in a state that is a leader in the field both nationally and internationally. Georgia surgeons were among the first to perform robotic surgeries, and in some cases pioneered robotically assisted procedures that are changing the lives of countless people around the world. Some are training the next generation of surgeons for robotic procedures, which many predict will become more common and more advanced with time. 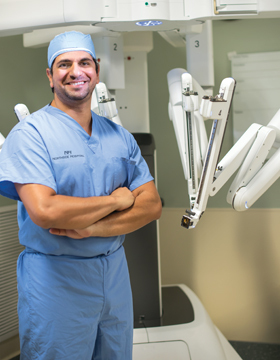 Robotic surgery is the most recent development in an ongoing quest to make surgery less invasive, says Dr. Eldaif, who is chair of the surgery department at Atlanta’s Northside Hospital. Northside ranks first in the Southeast and fourth in the world in the volume of robotic-assisted procedures performed. The da Vinci system offers the benefits of increased magnification and jointed hands with the same range of motion and dexterity as the surgeon’s own hands. Now, many surgeries that once required open incisions can be done minimally invasively. For procedures already being done minimally invasively, in some cases, the assistance of the robot improves results. Studies conducted at multiple medical centers, including Northeast Georgia Health System, for example, have shown outcomes of hernia repair using the da Vinci robot were superior to those using traditional minimally invasive techniques. And that’s just one of the ways robotic surgery is improving surgery – and lives. A healthy mitral valve is critical to controlling blood flow through the heart’s left atrium and ventricle. When the valve is damaged, repairing or replacing it has traditionally required a highly invasive and painful surgery with a large incision, lengthy hospital stay and even more lengthy recovery period. For many people, however, robotic-assisted surgery is making the procedure less traumatic and the recovery period significantly shorter. Unlike traditional surgery, which involves opening the front of the chest and spreading the ribs to expose the heart, robotic mitral valve replacement is performed through small incisions between the ribs on the right side of the chest, without disturbing the ribs, says Dr. Douglas Murphy, chief of cardiothoracic surgery at Emory Saint Joseph’s Hospital in Atlanta. A high-powered camera inserted through one of the incisions enables the surgeon to get a 3-D view of the heart’s structures. Surgical instruments, which are attached to thin robotic arms and inserted through additional small incisions, enable the surgeon to operate with the precision that previously only an open surgery allowed. Dr. Murphy performed Georgia’s first robotic mitral valve surgery at Saint Joseph’s in 2002. In December 2016, he attained a world record after completing his 2,000th robotically assisted mitral valve surgery. His team also developed a minimally invasive technique called LEAR (lateral endoscopic approach using robotics), which he has since taught to surgical teams around the world. The LEAR technique enables surgeons to perform open-heart surgery through five small holes in the right chest. Dr. Murphy says that patients appreciate the less invasive aspect of the technique, and the recovery is usually less than three weeks. When a young child has surgery, even a small incision can be large for a little body. And the scar left behind grows with time, becoming cosmetically displeasing as the child grows older. Yet minimally invasive procedures have rarely been used in children because of the small space in which the surgeon has to work and the precision required for their tiny anatomies. The introduction of robotics, however, is increasing the potential for minimally invasive procedures in young patients, says Dr. Brad Morganstern, a pediatric urologist at Augusta University who uses the da Vinci robot to perform a procedure called pyeloplasty on children as young as one. Pyeloplasty is done to remove a blockage at the ureteropelvic junction (UPJ), where the kidney meets the ureter. When the UPJ is blocked, urine can back up into the kidneys, a serious situation that can cause kidney damage. Removing the obstruction and suturing the kidney and ureter is a delicate procedure requiring great precision, says Dr. Morganstern. “When you have the smaller anatomy and you are trying to put anywhere from 10 to 20 stitches into this one small section, being able to precisely place that suture is paramount,” he says. Robotic surgery not only reduces the trauma of surgery in the short term, but it minimizes scarring later. Requiring three incisions about the size of the tip of his pinky – one of which can be hidden in the patient’s navel – is a huge advantage for pediatric patients, says Dr. Morganstern. For men undergoing removal of the prostate (prostatectomy), one of the most difficult aspects of the surgery is the loss of bladder control that almost inevitably follows. For many, a robotic prostate surgery pioneered by Dr. Rabii Madi at Augusta University is helping to solve that problem. Retzius-sparing radical prostatectomy is a technique that approaches the prostate from below, rather than above, the bladder. The approach allows surgeons to spare the ligaments and other connective tissues that are important to continence. “With [conventional] prostatectomy surgery, many people have trouble controlling urine, at least initially,” says Dr. Madi. “It can take up to one year.” With the new procedure, however, many men don’t have to experience incontinence at all, he says, and those who do recover their continence more quickly. When a person’s natural hip or knee is irreparably damaged due to arthritis or, less commonly, injury, replacing all or part of the joint with an artificial implant can relieve pain and restore function. But how well the new joint works – and for how long – depends largely on proper mechanical alignment of the implant, says Dr. Beau Sasser, an orthopaedic surgeon at Summit Sports Medicine and Orthopaedic Surgery in Brunswick and medical director of Southeast Georgia Health System Sports Medicine. Robotic assistance allows joint surgeons to get the best alignment. The MAKOplasty procedure, which was first available in Georgia at the Southeast Georgia Health System, works by using a CT scan of the patient’s hip or knee and creating a 3-D model of that joint. With the robotic arm’s real-time surgical feedback, surgeons resurface the joint, leaving healthy bone and tissue untouched and remove only diseased bone through a small four- to six-inch incision, Dr. Sasser says. An implant is aligned and placed in the joint with reproducible precision, which can result in a more natural feeling knee/hip and movement. Robotic surgery is most commonly used in urology, gynecology and thoracic surgery. It is used for situations requiring great precision – removing malignant tumors from the abdomen or chest, removing kidneys or treating endometriosis, for example – or in deep, difficult-to-reach areas of the body. Similarly, some surgeries can be performed equally well without the robot – appendectomies, gall bladder removal or the removal of benign ovarian masses, for example. • Availability of robots and trained surgeons. While most of Georgia’s larger hospitals offer robotic-assisted surgery, not all do. The da Vinci’s price tag of around $2.5 million makes it off limits or at least impractical for many small hospitals. And even when a robot is available, it takes a specially trained surgeon to use it. “The robot is only a tool to be used by excellent, well-qualified as well as well-trained surgeons who know how to do these operations in a traditional fashion,” says Dr. Eldaif. Training in robotic surgery is now offered in many surgical residency programs, but more complex procedures require an additional two-year fellowship, says Dr. Terris. • Patient size. While small children are benefiting from some robotic procedures, especially large patients may benefit as well. More flesh means larger incisions for the patient and greater challenges for the surgeon, says Dr. Green, a gynecologic oncologist. • Medical and personal issues. Factors such as previous surgeries, lung function and other health concerns influence a surgeon’s decision to use robotic surgery. Patient preferences can also play a role, says Dr. Terris. For example, if someone for religious reasons is opposed to blood transfusions, the surgeon may likely choose robotic surgery, which results in less blood loss. Although the first surgical robotics came to Georgia nearly two decades ago, doctors say robotic surgery is still in its infancy. They predict a day when the devices will become smaller, their use will become more common and the procedures they perform even more advanced. For now, the benefits of robotic surgery for patients are immeasurable – mainly the ability to receive the optimal results of surgery and get back to their day-to-day activities sooner. “By offering our patients the most advanced technology, supported by good data, we are able to enhance patient recovery, allowing them to return to their normal living activities and really maintain a great quality of life,” says Dr. Eldaif.